After training at the Central School of Art, London, in the early 1960s, Roger Michell and Danka Napiorkowska established Lustre Pottery together. Preoccupied with finely crafted early-industrial English earthenware, they set about developing clays and glazes in imitation of creamware. In 1974 they first made their 'Walking teaset', which became so popular that in order to satisfy demand they organised mass-production of the teaset by the industrial Staffordshire pottery, Carlton Ware. This version was hand-made for the Museum by the potters. Commercial production stopped in 1981. 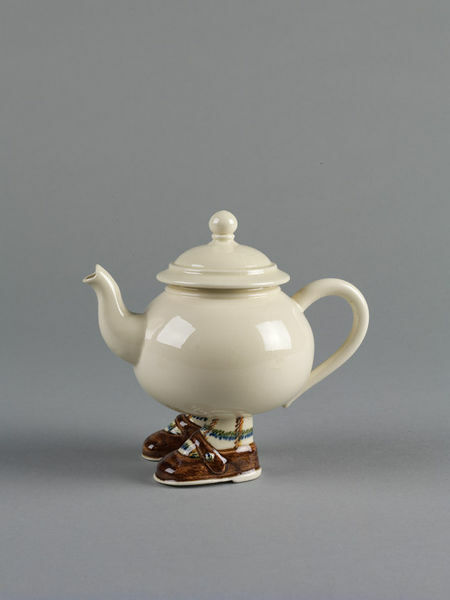 The quirky, Postmodern, and quintessentially English design can be interpreted as a reaction to the stonewares favoured by the studio pottery movement. 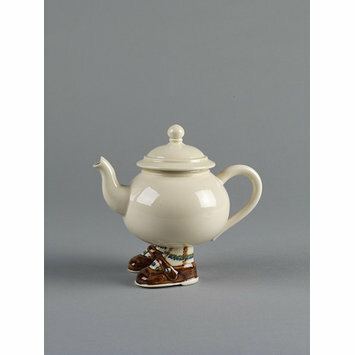 White teapot and lid, with feet, painted with brown shoes and white socks with brown and black checks.